This page features some "short reports" from some alpine climbs I did as a kid with my parents before I started climbing on my own around 2006, and started this website. These reports do not give a wide photo selection like most of my climbing trip reports, but they do provide some route beta and interesting details, and are special to me for nostalgic reasons. Until we moved to British Columbia in 1995, my family was living in the Midwest. Every summer we came out west to enjoy the mountains my parents had backpacked and climbed in during their early married life. 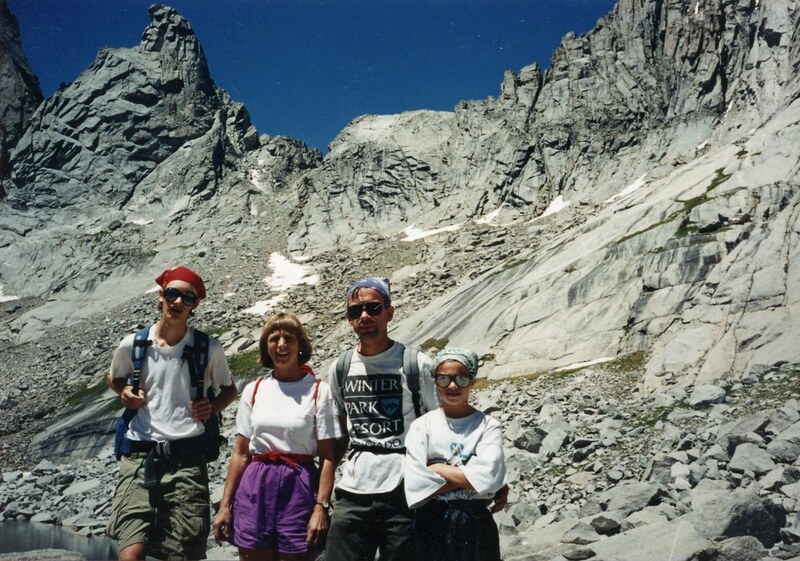 In 1994, my parents, my sister and I (9 and 11 years old), and two friends piled into our van and drove out to Wyoming, where we backpacked in the Wind Rivers for two weeks. This trip brought us through the amazing Cirque of the Towers area. My parents—fondly remembering the climbing days of their past—decided it would be fun to climb one of the moderate routes in the Cirque, and invited me to come along. They chose Overhanging Tower, a low class 5 peak in the heart of the Cirque peaks. This was my first alpine climb (my dad even let me lead a 15-ft pitch), and I loved it. I didn’t get the chance to climb again for several years, but this early climb set the stage for a future of mountain adventuring! In September 2007, I finally returned to the Cirque (with my cousin) and we climbed the two "Fifty Classic" climbs in the Cirque: the NE Face of Pingora and the East Ridge of Wolf's Head. In July 2014, twenty years after my first trip there, I again returned to the Cirque and climbed Overhanging Tower again along with five other summits: Overhanging Tower NE Ridge, Pingora SB and EF Left, Mitchell NF Left, Shark's Nose The Thoroughfare, and Sundance Pinnacle EF Center. In August 2014, I returned yet again to climb four more routes: Warrior I NE Face, Pingora NE Face, Warbonnet Black Elk, and Sundance Pinnacle NE Arête. I climbed this peak with my dad and a family friend on a family backpacking trip to Royal Basin. My parents had climbed dozens of peaks in the Olympics during the first few years of their marriage (late 70's). Then they started climbing in the Cascades and left the Olympics behind. This trip was a walk down memory alley for them. My I climbed this peak while on a short backpacking trip from Cascade Pass, up Sahale Arm, and over into Boston Basin. If I remember correctly, we were trying to climb Boston Peak, and ended up on top of Sahale. It's a beautiful area back there. My family (dad, mom, sister, and I) backpacked the Ptarmigan Traverse from July 29 to Aug 3, 2003 (this is one of my favorite backpacks I have done, click link for a few photos). On Day 5 of the traverse, we traversed Dana Glacier to Spire Col. My dad, sister, and I decided to scramble up Spire Point rising up to the west of the col. This was a fun Class 4/low Class 5 climb. It was the first climb that my dad, sister, and I had done together, and my third technical rock climb ever (my first was Overhanging Tower in the Wind Rivers of Wyoming in the Summer of 1994, when I was 11 years old, and my second was in the Sawtooths in Idaho in 1998, although I can’t seem to find any photos from that climb). The climb up Spire Point was blocky and took a couple of hours to get to the summit. This was a fun family adventure, climbed by my dad, mom, sister, and myself. In the late-spring conditions, the route was straightforward, especially under the sunny skies we were fortunate to have. It was mainly a long snow-slog. The 360° view from the top of the snow-capped North Cascades was well worth the climb. In September 2006, just after the glaciers on Baker started to get quite icy, my friend and I did a 12-hour car-to-car climb of the Coleman-Deming route on Baker. In June 2012, I climbed the classic North Ridge of Baker. My mom and I did a backpack trip up Easy Ridge, with tentative plans to climb Mt. Challenger. I had been high on the Challenger Glacier with my dad in July 2002, but we had not had time to climb the final rock pitch to the top. From any direction, the approach into Challenger is quite difficult. The Easy Ridge approach was no exception. The ridge itself was easy, but navigating our way over to Perfect Pass (the saddle between Whatcom Peak and Mt. Challenger from where you can get onto the Challenger Glacier) was not fun. There is a deep gully (called the "Perfect Impass") that is apparently possible to cross with some fixed protection and confident climbing skills, but my mom did not feel comfortable doing this, so we made a 1000+ ft descent to bypass the gully, and then did some horrendous bushwhacking to get up to Perfect Pass. By the time we got to the pass, it was too late to climb Challenger, so we relaxed in the meadows enjoying the view onto the vast Challenger Glacier. While my mom was napping, I decided to run up Whatcom Peak to the north of the pass. It was mainly a snow climb with a bit of rock scrambling at the top. It took 45 minutes to reach the summit from the pass. In July 2007, I successfully climbed Mt. Challenger. In August 2008, I did a complete traverse of the Picket Range, in which we approached via a climb up and over Whatcom. Click here for my trip report of the North Ridge of Whatcom Peak and the Complete N-S Traverse of the Picket Range. In August 2012, a seven-day adventure in the Cascades through Perfect Pass, and I again climbed the South Route on Whatcom. This was another family adventure. My dad, mom, sister, and I did a 6 day backpack trip through the Enchantments, with one of our goals to climb Prusik Peak. We had only one rack of climbing gear, so I led the route, with my sister following behind me and unclipping from the gear, and my dad leading behind her, clipping his rope back into the gear. I think this is the only technical climb my whole family has done together, and we had quite the adventure: my mom climbed it in her running shoes, my dad got his wedding ring stuck in a crack and broke his finger getting it out, my sister sobbed in (but made it up!) the chimney variation I accidentally chose at the top, and I had the opportunity to prusik on Prusik when we got our rope stuck on the descent. But all in all, the route was fun and moderate, with solid rock and great views. We descended by rappelling down the north face with a single rope. On this 2005 trip with my parents, we camped at Gnome Tarn with a great view of the steeper south face of Prusik. I vowed to return to climb this face. I had no idea it'd be as soon as the following summer. Click this link for a trip report for the Burgner-Stanley (5.9+) route on the south face of Prusik in July 2006. In October 2008, my sister and I returned to climb the West Ridge again and relive our 2005 family memories. Click here for a trip report for a climb of the West Ridge (5.7) in October 2008. In June 2015, I again visited Prusik Peak on a two-night trip and climbed four routes on the south face of the peak. Click this link for a trip report for the Burgner-Stanley route (5.9+), Solid Gold (5.11a), Boving-Christensen (5.10-), and a new route we called "Energizer Bunny" (5.10+ C1). In September 2017, I climbed the Beckey-Davis (5.9) route, the original route up the steep south face of Prusik.